Are you in need of a spring re-boot? Are you feeling flat and sluggish from the winter blues? Gained a few extra winter kgs? Constantly battling the winter bugs? Want to feel energetic and bounce through your day? Want to shed those winter kgs? Want to feel healthy and motivated again? Then grab your complimentary spring re-boot session with our health expert, Naturopath and Nutritionist, Tessa Cowley. 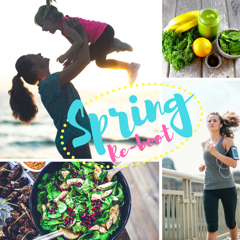 In this 30min complimentary spring re-boot session you will walk away with a thorough understanding on why you have been feeling flat this winter and some take home easy to implement tips to transform your health feeling energetic, healthy and motivated again. Book Me a Spring Re-Boot Now!